Sat., Aug. 4, 2018, 10:21 a.m.
SINGAPORE (AP) – Roller-coaster nuclear diplomacy between the United States and North Korea hit highs and lows on Saturday as the countries’ top diplomats traded polite words and barbs, leaving efforts to rid the North of its nuclear weapons at an uncertain juncture. At a security conference in Singapore, U.S. Secretary of State Mike Pompeo accused North Korea and countries including Russia of continuing to violate U.N. sanctions aimed at pressing Pyongyang to give up its nuclear arsenal. But at the same time, he oversaw the handover of a letter to North Korean leader Kim Jong Un from President Donald Trump and exchanged pleasantries with the North’s top diplomat. 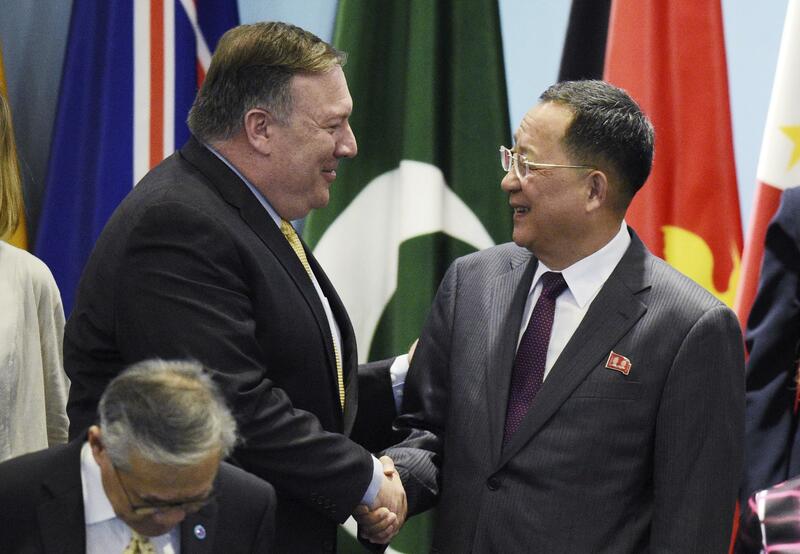 North Korean Foreign Minister Ri Yong Ho, meanwhile, greeted Pompeo with a smile, but then delivered a scathing attack on the Trump administration for approaching the negotiation poorly by insisting on sanctions enforcement. Ri said North Korea would not be forced into acting unilaterally and demanded that the U.S. undertake “confidence building” measures if the negotiation was to be successful. “Confidence is not a sentiment to be cultivated overnight,” he said. “In order to build full confidence between the DPRK and the U.S., it is essential for both sides to take simultaneous actions and phased steps to do what is possible one after another.” North Korea’s official name is the Democratic People’s Republic of Korea. “Only when the U.S. ensures that we feel comfortable with and come close to it, will we be able to open our minds to the U.S. and show it in action,” Ri said. Ri, though, appeared unmoved and accused elements of the U.S. government of going against Trump’s wishes by taking a hard line on sanctions. “What is alarming, however, is the insistent moves manifested within the U.S. to go back to the old, far from its leader’s intention,” he said. Instead of responding reciprocally to North Korea’s suspension of nuclear tests and missile launches and other goodwill gestures such as the return of suspected remains of American troops killed in the Korean War, the U.S. has maintained hostility, Ri said. “The United States, instead of responding to these measures, is raising its voice louder for maintaining the sanctions against the DPRK and showing the attitude to retreat even from declaring the end of war, a very basic and primary step for providing peace on the Korean Peninsula,” he said. He also accused Washington of taking “extremely inappropriate moves” by discouraging third countries from sending high-level delegations to the North’s 70th anniversary celebrations in September. State Department spokeswoman Heather Nauert said Trump’s reply to Kim was given to Ri by Sung Kim, the U.S. Ambassador to the Philippines who has been leading logistical negotiations with the North on its pledge to denuclearize. Nauert would not address the content of Trump’s letter to Kim. Earlier Saturday, Pompeo warned Russia, China and other countries against any violation of international sanctions on North Korea that could reduce pressure on the North to abandon its nuclear weapons. Pompeo’s comments came on the heels of a new United Nations report that found North Korea has not stopped its nuclear and missile programs and is violating U.N. sanctions, including through illicit ship-to-ship transfers of oil. Speaking on the sidelines of the Singapore forum, Pompeo told reporters that the U.S. has new, credible reports that Russia is violating U.N. sanctions by allowing joint ventures with North Korean companies and issuing new permits for North Korean guest workers. He said Washington would take “very seriously” any violations, and called for them to be roundly condemned and reversed. Late Friday, U.S. Ambassador to the United Nations Nikki Haley raised the alarm, saying that “talk is cheap.” “Russia cannot support sanctions with their words in the Security Council only to violate them with their actions,” she said in a statement. She made the remarks as the U.S. asked the Security Council to add a North Korean bank executive, a North Korean company, a Chinese company and a Russian bank to the U.N. sanctions blacklist. Despite the warning to Russia, Pompeo said he remained optimistic that Kim will follow through on his pledge to Trump to denuclearize. But he said the timeline for the North’s full and final denuclearization remains a work in progress. Published: Aug. 4, 2018, 10:21 a.m.